images and text by 2014 alum Jean Bettingen, from the 2015 issue of "All the Best, Alice"
Sometimes I get dizzy and feel overwhelmed. There are probably a lot of people in our globalized society burdened with an over-pronounced self-reflexivity, who feel similarly when it comes to defining themselves. I wonder how I would be able to pin down my essence in a world of flux, a world in which everything and everyone is defined as a project of perpetual reinvention. 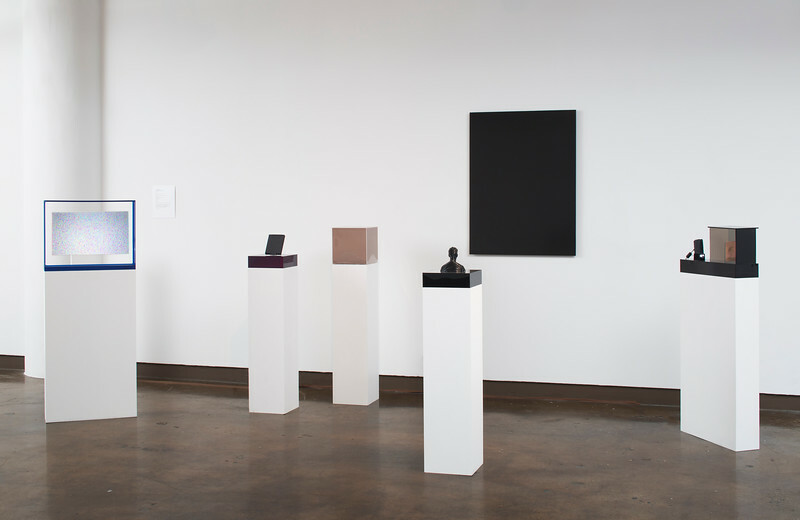 Cenotaph for My Shadow is a body of sculptural and photographic work that addresses and visualizes the prevailing sense of disconnection I feel towards my self and the world, my inability to grasp and comprehend the I, and at the same time, my fear of its loss. This project aims, through various strategies and in mixed media, at the depiction and manifestation of my Cartesian self despite the representational dilemmas of lens based media. I explore the need that drove Roland Barthes, amongst others, toward an ontological questioning of the photographic medium: “What Barthes wants is a rescue of his profound self through the solid evidence of photography.” So do I. 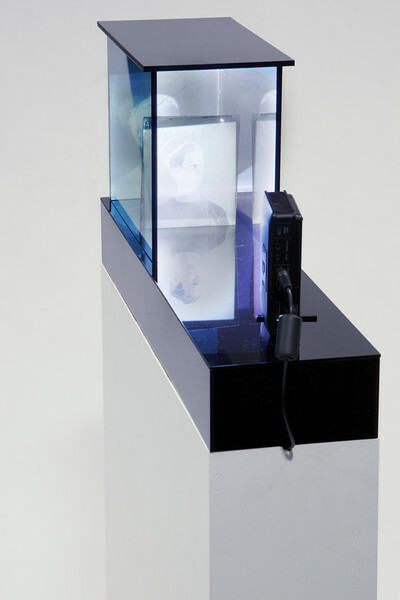 The sculptural installation “Autopoiesis” suggests the nature and the spirit of my investigations: a 4x5" wet-plate collodion is placed between 8x10" two-way mirrors. 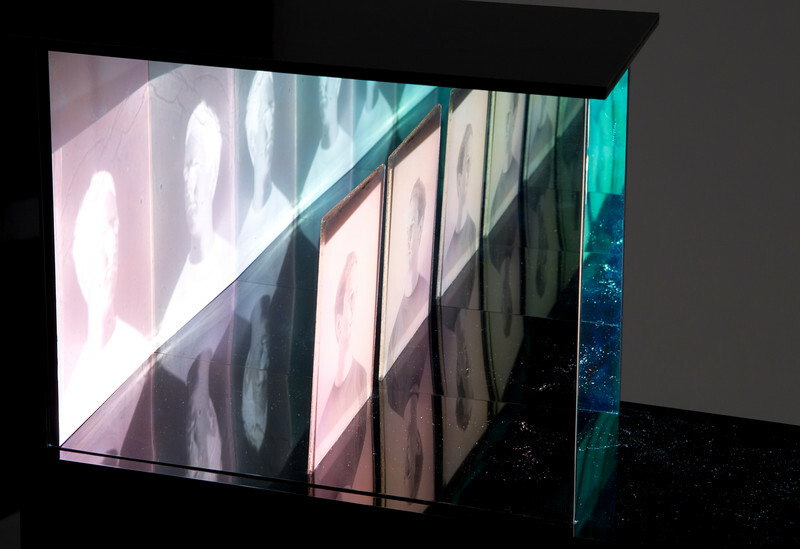 The peculiarity of this old photographic medium is that it can be used as a negative to print a positive or as a unique positive. When light illuminates the plate, it glows and brings a positive portrait image to life. 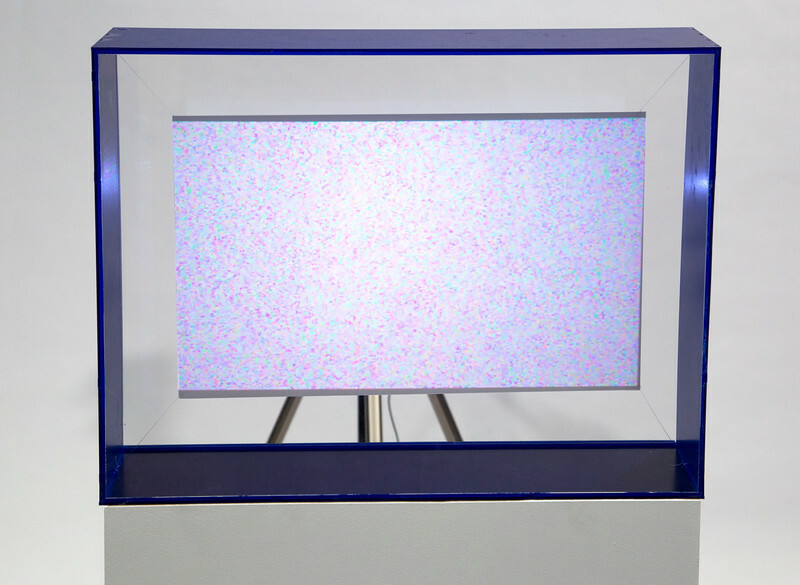 As viewers walk around the installation, they experience an infinite space in which the portrait image seems to disperse into nothingness. My questions of self-visualization in “Autopoiesis” began when I was 11 years old and my mother died. The only tangible thing remaining of my parent was a cardboard box half-filled with family pictures. Discomfort arose in me whenever I looked at them, not solely because of the pain and grief, but also the intrinsic suspicion that the person depicted in the photographs was no longer my mother; and yet there she was, smiling at me. This sense of disconnection made me question what was captured and embedded in those pieces of paper. It certainly was not my mother in person. I had witnessed her burial; at least that was a certainty. Were those photographs just an anchor to whatever was left of her in me? I still remember some of the moments shown in the photographs, moments that I spent in the presence of my mother. But the more time that goes by—the more distance accumulated between the depicted and remembered moments—the more I wonder about the chain of causality between memories and images. Do I genuinely remember these moments or were they incepted into my consciousness by these photographs? This uncertainty triggered the destabilization of my self-perception because I couldn’t comprehend the authorship of my self if I considered my past as its foundation. Did I build my history and identity narration not only on my own perception but also on the moments that another person judged important enough to capture? How is it possible to photographically capture the essence of a person? It seems that in every effort to freeze a person in an image, an unwanted distance to life is created. 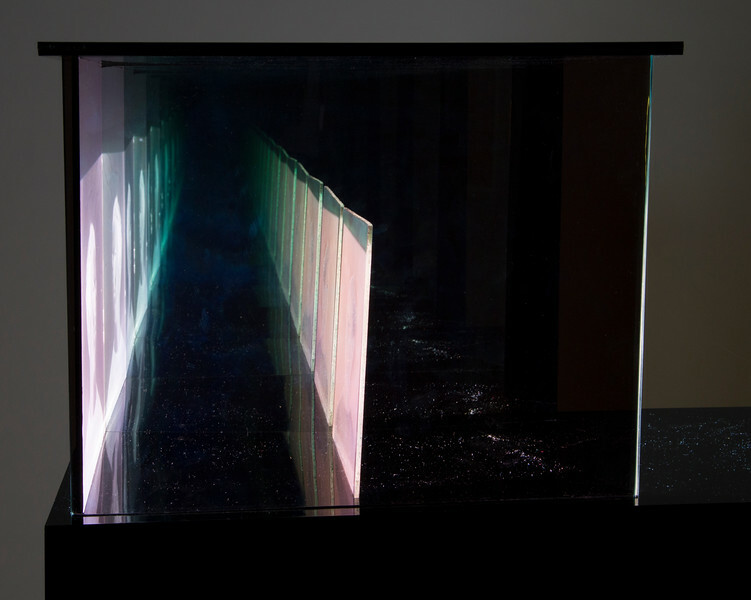 This project approaches its goal through various techniques, incorporating old alternative processes, video projection, 3D capture and 3D printing. This allows viewers to experience my represented self in various forms, and they can explore which media offer a deeper perception of my self. Following Barthes’s concept of air, which is somewhat similar to the description of the aura by Walter Benjamin, inherent in the photograph (Belting, 2013: 195 / Barthes, 1981), a lot of the works in this project abstract deliberately from showing facial details. The air, the essence of a person, does not lay in the detailed representation of the human face, but is or is not captured in the image and may or may not be perceivable by the viewer . It is more likely that the viewer will be able to grasp my air if the distraction of my face has already been subtracted from the viewing experience. Another approach is described by Hans Belting (2011) as he defines a picture as an image with a medium, meaning that the image of my self exists already in an intangible or liminal space and needs a manifestation through a medium to be turned into a perceivable picture. A good example of my investigation into these medial manifestations is the juxtaposition of the pieces “5 Hours” and “Negative Dimension”: they are both the same image, me, but diverging medial forms. 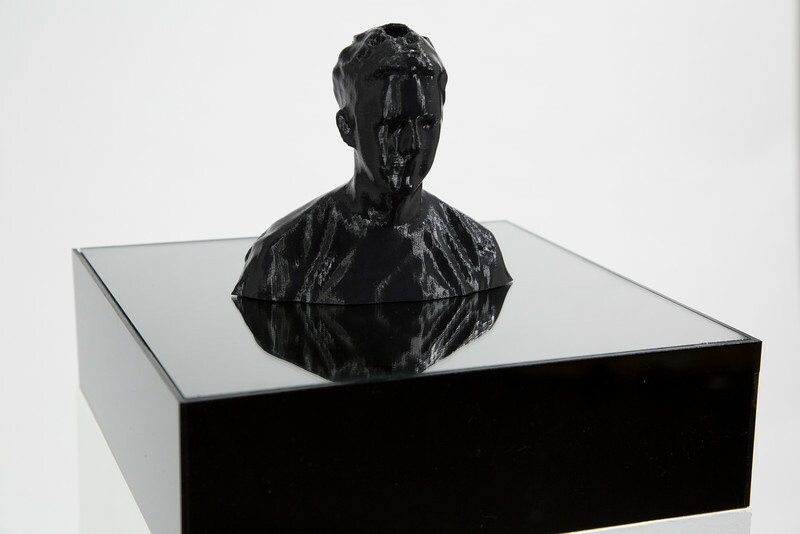 “5 Hours” is a black box that contains an exposed but undeveloped film sheet containing a self-portrait and “Negative Dimension” is a 3D print generated through another self-portrait—or rather an image of my self? Each piece in this body of work can be considered an attempt to capture the process of self-reflection, an attempt to secure the feeling of constancy. Though the endeavor is also an interesting dilemma in itself: as Jorge Molder put it, photographing yourself creates a being in the between, a space between the self and someone else. Further, following Barthes’s reasoning, the very act of photographing myself transforms me into the eidos of death. This project does not solely try to capture and display my real essence but also investigates the stability of such and its representation as a visible manifestation of my presence just like my shadow on the ground. Is there a way to escape this mentioned in the between? All imagery in this project is in the en-face perspective: straight on, eyelevel, and limited to the bust. The focus on images of the upper body seems appropriate as I assume that my self is located in my mind. Much of my work is dominated by black—I like to consider black as the anti-photograph or a negative imprint as it is evidence of the absence of the constituting element of a photograph: light.